History abounds with examples of the E.U.’s incompetence, particularly around its lawmaking. But an absolute corker is going on this year over automotive emission targets. From 2021, the E.U.’s target for average carbon dioxide emissions from cars is 95 grams per kilometer, in an effort to force innovation in more efficient power units and to lower environmental pollution – a pragmatic and, most would agree, sensible objective. Carmakers can pool the emissions from models across their range in order to achieve an average below this level to avoid fines. For example, Volkswagen can offset lower emissions models from their VW, Seat and Skoda ranges against those from higher emission models made by Porsche and Audi cars. It’s a debatably acceptable compromise. Ultimately, it does little to increase incentives to improve gas-guzzling, top-of-the-range models, but it does satisfy the E.U.’s objective to reduce average new car emissions, and so still offers an incentive for the improvement of small- and medium-size models and the rollout of electric vehicles. So when does a good idea deteriorate into a farce? When competing manufacturers can strike agreements to pool their vehicle ranges, is the answer. Witness the sham outlined in the Financial Times this week of Fiat Chrysler Automobiles (FCA) agreeing to pay Tesla hundreds of millions of euros so the electric carmaker’s vehicles are counted in FCA’s fleet in order to avoid FCA being hit by some $2 billion in fines. Last year, FCA’s fleet — which includes Jeep, Alfa Romeo and Maserati, alongside smaller models by Fiat — averaged 123 grams per kilometer in emissions, according to UBS, while Tesla obviously registered zero with a fully electric lineup. It must be said, this is not a solely E.U. wheeze. The U.S. authorities allow Tesla to sell zero-emission credits to other carmakers; the automaker made $103.4 million in this way last year, the Financial Times reports. But you have to ask: what is the point in setting a target only to let carmakers wriggle out of meeting it by buying credits from a competitor? Regulators will argue the incentive remains because the carmaker now has a real financial cost attached to those emissions that will act as a spur to reduce the average in the future. The pressure is off FCA, as they pay a few hundred million to Tesla and avoid a $2 billion fine in 2021. Indeed, FCA has announced that while it will continue to work toward lowering its average emissions. 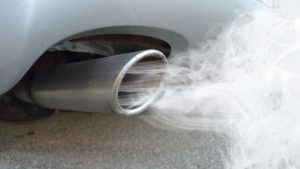 However, the narrow definition of fuel consumption measured as grams of carbon dioxide per kilometer means the group will continue to sell diesel vehicles that produce less carbon dioxide than petrol models, but vastly more carbon particulate emissions. The only golden lining to this sorry tale is you will continue to be able to buy the Ferrari reworked petrol-powered Maserati Ghibli, even if it does pump out a whopping 223 g/km – just so long as there is a Tesla or two somewhere saving the planet for you.